Modern Material Handling’s latest issue has a detailed article about Giant Eagle’s efforts to reduce forklift operator travel time and to improve warehouse efficiency. 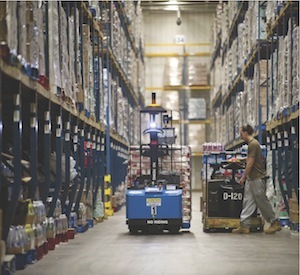 Giant Eagle is using four Seegrid pallet-handling robotic industrial trucks in a 440,000 square-foot distribution center in the Pittsburgh area, and four others in a distribution center in the Cleveland area. The robotic pallet trucks are used to move inbound pallets from the receiving area to drop-off locations. This route is typically better served by unmanned vehicles because manned forklifts are better suited for more complicated tasks. Giant Eagle has been able to reduce unmanned forklift travel by 20-30% at the locations where the robotic pallet jacks are in use. The full article is available at Modern Material Handling.